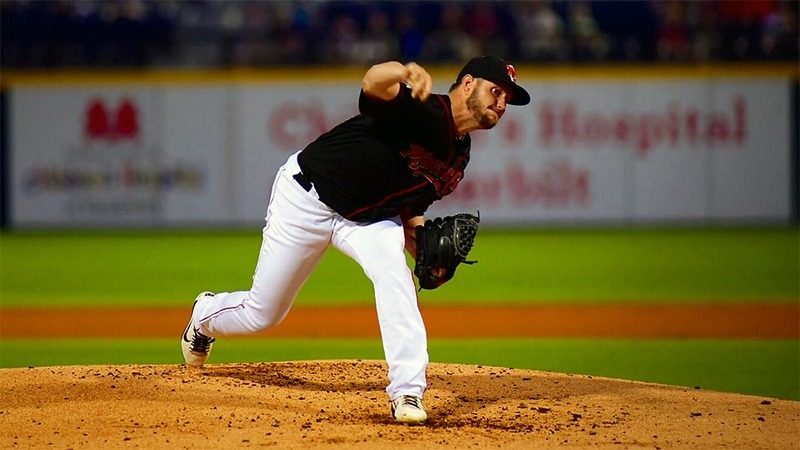 Nashville, TN – The Omaha Storm Chasers scored a run in the 13th inning to edge the Nashville Sounds, 3-2, at First Tennessee Park Monday night. The four-hour, 14-minute marathon came to an end when the Storm Chasers put together a rally after both teams were held off the scoreboard since the sixth inning. With Nashville’s Patrick Schuster on the mound, Cam Gallagher singled to right-center to start it. Hunter Dozier doubled to the gap in right-center to put runners at second and third for Billy Burns who put Omaha on top with a run-scoring groundout. Omaha’s Jake Newberry set the Sounds down in order in the bottom of the 13th to seal the series-opening win for the Storm Chasers. Both starters were effective as Nashville’s Josh Smith tossed five shutout innings in a spot start, and Omaha’s Jace Vines limited the Sounds to two runs over six innings in his the first Triple-A start of his career. Smith made a few big pitches to get out of a couple of jams throughout the night. With a pair of runners on in the first, he got Jorge Soler to bounce into an inning-ending 5-4-3 double play. With two on in the fifth, Ramon Torres hit a line drive that looked ticketed for the right field corner. Sounds right fielder Yairo Munoz raced towards the line and made a diving catch to take extra bases away from Torres. Smith stranded the two runners by striking out Raul Mondesi to end the inning. The Sounds started the scoring in the second when Joey Wendle led off the inning with a sharp single to right field. After Chris Carter was retired, Munoz drilled a ball off the right field wall for a run-scoring triple to make it 1-0. Munoz was at it again in the fourth when he knocked in his second run of the game. Renato Nunez started the inning with a double down the right field line and came around to score on a base hit up the middle by Munoz. Omaha evened the game in the sixth when Jorge Soler launched a two-run homer off reliever Chris Bassitt. That was the last of the scoring until the 13th inning when Omaha staged the game-winning rally. Nashville’s Raul Alcantara, Lou Trivino, and Sam Moll combined for five shutout innings in relief. Game two of the four-game series is scheduled for Tuesday night at First Tennessee Park. Right-hander Daniel Mengden (2-3, 3.73) starts for the Sounds against right-hander Christian Binford (5-10, 7.78) for the Storm Chasers. First pitch is scheduled for 7:05pm.